If you've been searching for an online source for delicious mushrooms and more, there's no need to look further. Oregon Mushrooms is proud to provide customers with some of the best mushrooms that the Pacific Northwest has to offer. We love the amazing variety of mushrooms in the area and know that many others do as well. That's why we've worked hard to make it easy for you to buy mushrooms over the Internet. From our humble beginnings on eBay, we have continued to grow in size and selection without ever overlooking our dedication to quality customer service. Oregon Mushrooms is also pleased to offer mushroom specialty items featuring morel mushrooms and porcini mushrooms. 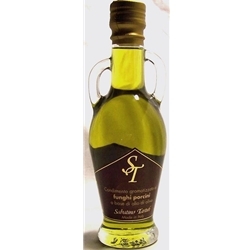 Browse our inventory for interesting products such as morel and apricot-infused olive oil which is sure to be a taste sensation on pasta or drizzled over pizza, bruschetta and crostini. In our inventory of porcini items, you’ll find top notch imported porcini oil and porcini powder. Every year we hunt for and harvest fresh wild porcinis, and after hand selection of the best specimens to fill in-season orders, we dry and pasteurize the rest for our dried porcini and porcini powder stock. Our porcini powder is 100% pure with no preservatives, and it imparts a robust, nutty flavor to stocks, soups and sauces, and works well as a rub for red meat and poultry. Try our earthy delights!